A complete cast copper alloy uniface coin weight, of Medieval to Post Medieval dating (c. AD 1350 to c. AD 1550). The weight is sub circular in plan and the obverse face has a moulded design consisting of a fleur de lis / lys, with a pellet border. The reverse face is plain and undecorated. The coin weight has a diameter of 14.25 mm and is 2.70 mm thick. It weighs 2.96 grams. Withers & Withers (1995, 33) suggest that the fleur de lis / lys was used in both England and France for a florin between c. AD 1350 and c. AD 1550. 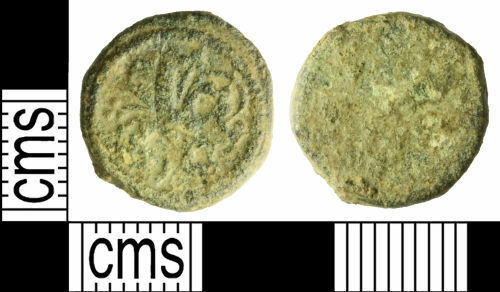 Two similar coin weights have been recorded on the PAS database as FAKL-54FE02 and IOW-F9C601. Withers, P. & Withers, B. 1995. Identifying Coin-Weights Found in Britain Lions Ships and Angels. Galata Press.